Home Who’s Brewing in Ottawa 2013 July 03 FEATURE: Capital Mashup – Josh Larocque, Broadhead Brewing Co. FEATURE: Capital Mashup – Josh Larocque, Broadhead Brewing Co.
Carney Kilian, brewer at Broadhead Brewing Co. and Iain McOustra, brewer at Amsterdam Brewery. Our second interview is with Josh Larocque, head brewer at Broadhead Brewing Company in Ottawa. 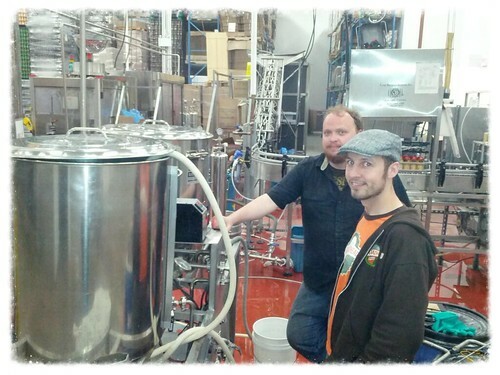 For the Capital Mashup he and brewer Carney Kilian were teamed with Iain McOustra of Amsteram Brewery. Broadhead brews six regular beers and the occasional seasonal out of their DIY brewery in an industrial park off Hunt Club. This past October they moved to a larger spot in the same warehouse and increased production. Now there won't as many fights over the last growler of Wild Card Ale. additions of Sorachi Ace hops late in the boil. typically falls on only a couple individuals at the brewery to pull it off. light the mash burner when it was really the boil burner that had gas! on our current stock at the time. FEATURE: Capital Mashup - Mario Bourgeois, Cassel Brewery Co.FEATURE: Capital Mashup - Shane Clark, Beyond the Pale Brewing Co.